You are here: Home / Bloodhounds & Scent / Let Us Help You Form A PET DETECTIVE TEAM In YOUR Community! The MAR “pet detective” training program was something I envisioned way back in 1997 after my police bloodhound, AJ, went lost in the woods. After using another search dog to track him down, I decided to experiment to see if other dogs could be trained to find lost pets. Here is a clip from those early years (1999) when I had my first small group of dogs in training (through Pet Hunters, before it became Missing Pet Partnership). It wasn’t until 2005 that I launched the first 5-day MAR training course and ultimately trained over 125 pet detectives across the USA, Canada, and even from Mexico, Japan, Ireland, and Italy. Most of those who attended the course were individuals who’d read my memoirs (The Lost Pet Chronicles) and thought they wanted to become individual pet detectives. A few did, most didn’t. The few who did venture to offer pet detective services usually focused only on the use of tracking dogs. None of the students went on to develop any type of team concept. Then came the recession in 2008. Growth of the MAR course came to a crashing halt due to the down economy. 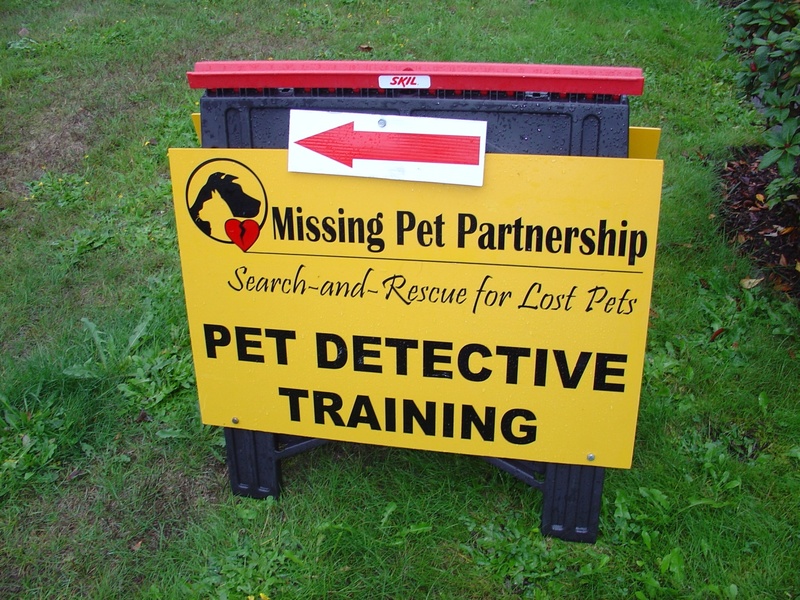 What MPP did was use that time (2008 through 2012) to focus on developing an operational community-based lost pet search-and-rescue team here in Seattle. We tested out new ideas and refined old techniques. Now that the economy is on the upswing, we’re ready to start training up teams across North America. While individuals are still invited to attend our training, our focus with our MAR course is teaching TEAM skills and recovery techniques to search for and capture missing dogs and cats. Although I started out as an individual pet detective (in 1997), I’ve since learned that in many cases it is just not enough to hire an individual pet detective who’ll show up with a tracking dog, charge a fee ($12,000 in one case! ), and then leave town because they’re off to go work the next case in another community. Pet detectives with search dogs are great tools, but what is also needed in many cases is A TEAM OF LOCAL VOLUNTEERS who can help with surveillance, trapping, intersection alerts, and other techniques that require several people and time. Thus MPP is looking to train up community-based teams of volunteers who can spend extended periods of time, however long it takes like the 7 weeks it took MPP volunteers to use surveillance cameras and drop net to capture Sophie or the truly remarkable case where it took our volunteer team 4 months to capture Bebe the cat. 1. Scent trailing dogs used to track the scent trail of lost dogs, as this 1999 clip demonstrates of my bloodhound A.J. as he trailed the scent of a lost dog named Bubba. 3. Surveillance cameras and operations used to detect and then humanely capture panicked, displaced cats, just like what were used in the searches for Lil’ Miss Kitty, Binky, Cookie the cat and Bebe (watch video footage of the Bebe case here). 4. Surveillance cameras and operations used to detect and then humanely capture panicked, skittish dogs who run from everyone, just like Bill did for over a year! 5. 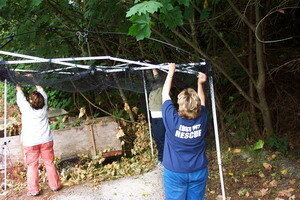 Drop net operations to capture dogs that just can’t be captured in a humane trap, just like how MPP caught Sophie. 6. Magnet dogs, snappy snares, and calming signals used to lure and capture panicked, skittish dogs who run from people but readily come up to a friendly dog, like MPP did to recover Mack the pit bull. 7. 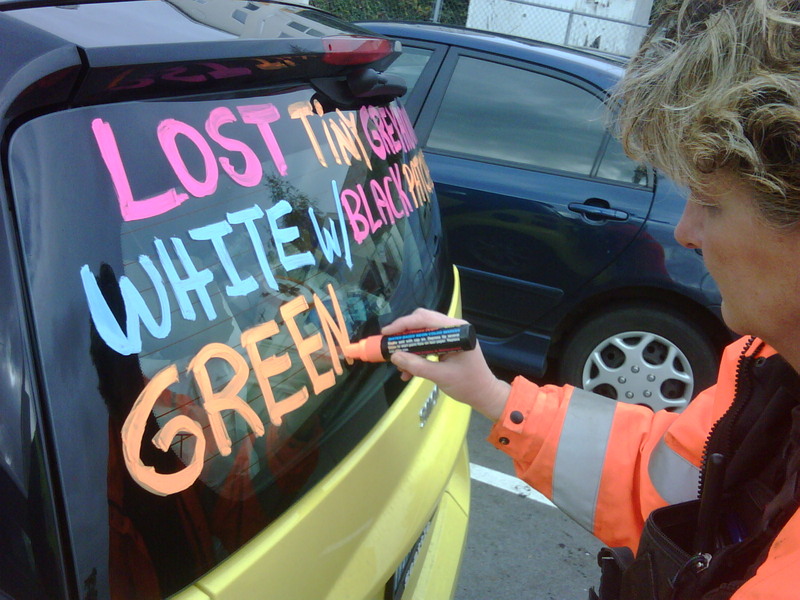 Intersection Alerts and “tagging” of cars to capture the attention of passersby in order to help mass market and recover a lost dog, like MPP did in the sad recovery of Lena, a dog who escaped her carrier at SeaTac airport. 8. House as Trap and other unique capture techniques used to capture panicked dogs and cats when normal human traps do not work, just like MPP to recover Ruffles, Ike, and Vivian. 9. The development of animal shelter lost pet recovery programs, like 4th of July Lost Pet Recovery Booths and year-round animal shelter pet detective services like those currently in development through Missing Pet Partnership’s “Mission Reunite” program (in collaboration with the Regional Animal Services of King County shelter located in Kent, WA). 10. And finally, MPP educates students in the critical aspects of animal and human behaviors that often prevent lost pets from being recovered, like “The Silence Factor” that kills many lost cats like the sad case of Monet. 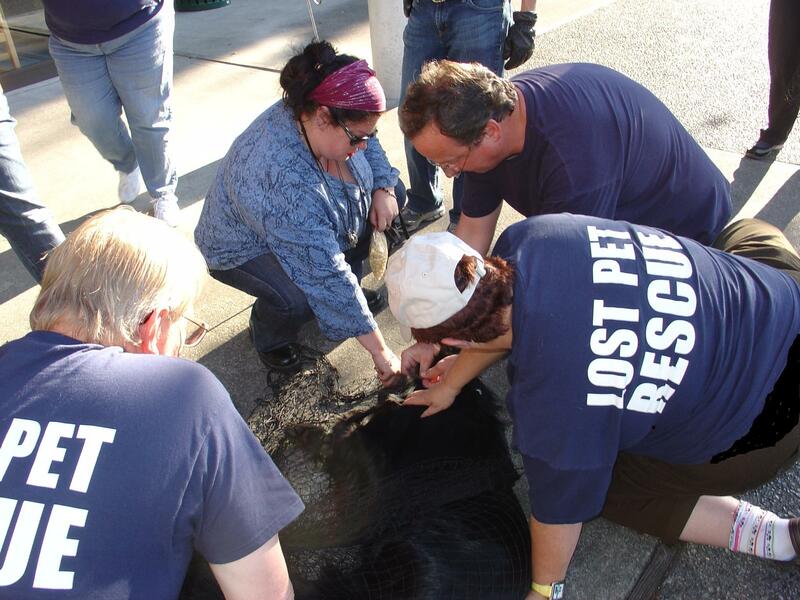 Our MAR team in Seattle receives 3 to 7 calls a day from pet owners asking for help in recovering lost companion animals. Last year we logged over 600 cases. Now that we’ve developed our team in Seattle and refined our team development, we’re ready resume our MAR training program! MPP is looking to partner with animal rescue groups, no kill shelters, animal shelters, and groups that want to form lost pet search-and-rescue teams in their own communities. Currently, MPP is working to develop a 6-week Missing Animal Response on-line (webinar) training course that we plan to launch in the fall of 2012. 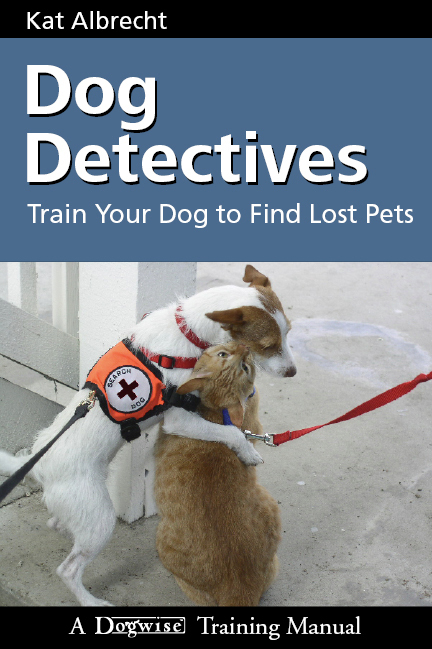 To prepare for the MAR course and to learn more about how to train a MAR cat detection dog and/or a MAR trailing dog, get a copy of my book Dog Detectives: Train Your Dog To Find Lost Pets. For more details on how to sign up for the MAR webinar, go the MPP web site training page.